Massive Earthquake Strikes Tokyo Region of Japan Tomorrow! | Chaos Sweeps Away the World We Know! The Disaster, current events & Catastrophe Blog. Forecasts for 2014 to 2022. Read tomorrows news today! Plus current economic, commodities, stock indices and financial news. ← Picture of the Day – Cades Cove Sunset. August 24, 2014 – Giant Earthquake Strikes Tokyo Region Tomorrow! 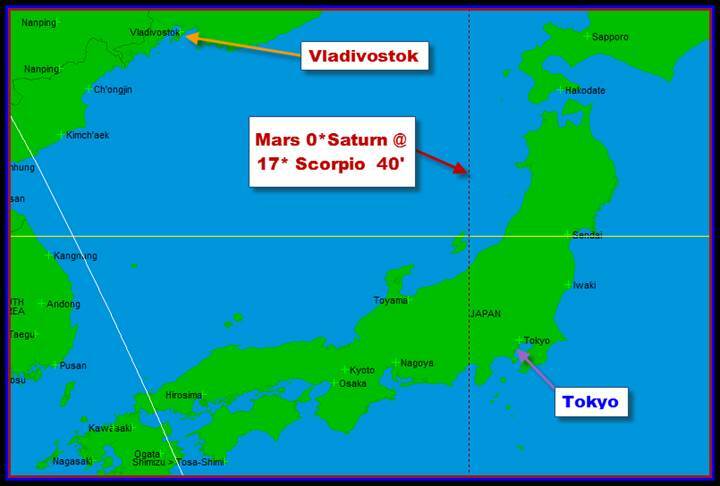 Mars is conjunct Saturn tomorrow and it could mean a massive earthquake in the Tokyo region of Japan as shown on the map above. This earthquake should be greater than magnitude 8.5! This event occurs at 12:30PM PDT August 25, 2014. Therefore, I would assume the quake will hit sometime between now and 12:30PM. The closer we get to the exact time of the conjunction, the stronger the forces will be and the more likelihood a quake will strike. The potential damage for this quake is incalculable. For informational purposes, I have shown the location of Vladivostok; the current scene of the Russian/Ukrainian debacle. This entry was posted in Astrology, Astronomy, Earthquake, Events, Forecast, Japan, Mars, Mundane Astrology, News, Predictions, Quakes, Saturn and tagged transiting Mars conjunct transiting Saturn Monday August 2 2014 in Scorpio at 14 degrees and 40 minutes of longitude. Bookmark the permalink.